It’s not uncommon to see different types of birds in the San Francisco Bay Area. Since San Francisco is located on the Pacific Flyway, many migratory birds travel along this route depending on the season. The San Francisco Bay Area is home to many bird watching locations that allow you to observe and photograph these birds from a distance. The Baylands Nature Preserve is known for being one of the best bird watching locations in the West Coast. This 1,940-acre marshland boasts of diverse wildlife and a peaceful atmosphere. While walking along the 15 miles of multi-use trails at the Baylands Nature Preserve, you will be able to spot around 150 species of birds, including the American white pelicans, the California clapper rail, mallards, and many more. If you want to take a short hike while bird watching, head to the Richardson Bay Audubon Nature Trail. This mile-long trail will treat you to sweeping views of the peaceful bay. Along the way, you’ll most likely spot pelicans, cormorants, sandpipers, warblers, and hummingbirds. The Coyote Hills Regional Park provides plenty of bird watching opportunities in both the upper and lower areas of the park. In the upper area, you can spot hawks and eagles while trekking through the hilly trails. And in the lower area of the park, you can enjoy a leisurely walk through the flat marshland trail while looking for egrets, waterfowl, and ducks. The 30,000-acre Don Edwards Refuge offers a changing array of wildlife depending on the season. During the spring, you’ll run into marsh wren, barn swallows, and common yellowthroats. Summertime gives you an opportunity to spot the endangered California clapper rail. 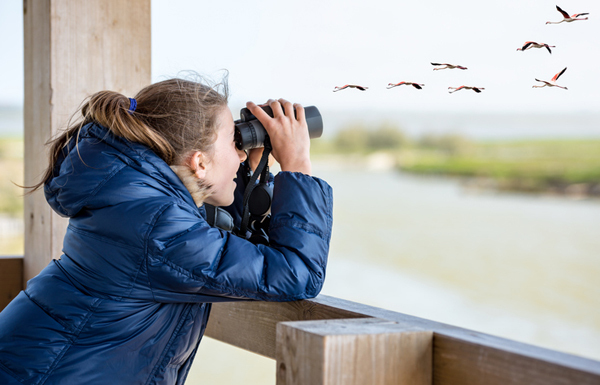 During the fall and winter seasons, you’ll be able to observe the hundreds of thousands of migrating birds. Home to a wide variety of nesting birds, the Hayward Shoreline is one of the most popular places in the San Francisco Bay Area for watching birds. This 1,600-acre marshland is filled numerous walking and biking trails, giving you a unique opportunity to explore the area while on the lookout for any of the 200 species of birds that can be spotted on the shoreline. If you’re curious or fascinated with the endangered California clapper rail, there’s no better place to find them than at the Elsie Roemer Bird Sanctuary. Located in Crown Memorial Beach, this sanctuary offers you one of the best chances to spot the California clapper rail, along with plenty of other species found along the marshes and shoreline. Common in the area are seabirds, egrets, and long-billed curlews. Nothing compares to the number of fascinating outdoor and nature-inspired activities in San Francisco. That’s why living in this area is such a unique and unforgettable experience. If you want to know more about the real estate opportunities in San Francisco, give Bernie and Mike Homes a call at 415 906 6000 or 415 308 4281.